Driving solo to work is one of the big green frowns, and so employers should take steps to encourage their staff to adopt green transport alternatives. Whereas most ‘green office’ policies are welcomed by employees and duly adopted, changing over to a greener mode of transport to work can prove a real stumbling block. Few of us enjoy travelling to work as it is without creating any more stress and strain by having to adopt a new commuting regime. Therefore for a green transport policy to work it is necessary for employers to invest time and resources in promoting alternative forms of commuter transport over that green transport black spot - driving alone. Relaxing in their private bubble of comfort and quiet before facing the heat of the coalface, it’s no wonder so many British commuters love to drive to work solo. Of course, there are downsides. For one it is a hugely inefficient use of energy. It is estimated that every day car commuters are accompanied by 38 million empty passenger seats on their journeys to work. By introducing a commuter car share scheme you would cut the number of cars on the roads, thereby improving fuel efficiency and reducing environment pollution, and also save money – an increasing concern in this time of soaring petrol prices. Your office could set-up an online employee car-sharing facility that allows staff motorists to advertise their empty passenger seats. If your office is not large enough to support such a scheme then there are numerous car sharing sites online. The National Office of Statistics claim that if every regular commuting motorist gave one other driver a lift, just once or twice a week, then the number of cars heading to and from work would fall by 15%. Their stats also show that an average motorist could save around £350 a year by sharing their driving duties with two other commuting motorists. However if staff are able to pull themselves free from the comforts of the car altogether and share with many more passengers then greater energy saving is to be had by switching to public transport. Individually buses and trains are power-hungry beasts that eat up a lot of energy but if their emissions tally is divided by the number of passengers on board then they – when full – present a much greener alternative to the car. It is estimated that commuting by train instead of the car could cut your annual emissions by two-thirds. Of course the downside is that Britain’s transport system is far from up to standard, with widespread complaints about exorbitant costs, delays, absent routes. Making public transport information, such as times, routes and prices, easily available around the workplace. Offer to fund or subsidise seasonal transport tickets. Management setting a good example by adopting public transport themselves and using it for business purposes. Being understanding about staff arriving late due to transport delays. Of course if you want to cut out your commuting carbon emissions completely, then there’s always the option of cycling to work or even walking. 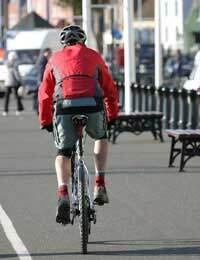 Provide information regarding cycle routes, bike repair shops etc. Shipping in free cycling helmets. Provide special office bikes and link up with a local bike shop for maintenance services. Offer secure bike storage facilities. Install changing rooms and shower facilities. The government is also doing a bit to help promote commuter cycling on an industrial scale. In 1999 they set up an incentive scheme – now known as ‘Cycle to Work’ – to encourage employers to help their workers acquire tax-free bikes. Employees benefit from improved health and better quality bikes – as their money can go further – employers benefit from fitter, bright-eyed and more punctual staff, and the environment are able to breathe in a bit deeper.